I always suggest my couples bring two outfits to their engagement session: one casual and the other a little more formal. This helps create two different looks and a lot of variety in your engagement portraits! One suggestion I make in my exclusive client Engagement Session Style Guide is to consider renting something to wear. Yep, you read that right, you can rent high end straight-off-the-runway dresses to elevate your engagement session style. Imagine how amazing you'll feel in a super gorgeous outfit, cuddled up with your honey during your engagement session! One of the keys to having great portraits is feeling ultra confident and comfortable in what you're wearing. I've put together a list of my TOP TEN FAVORITE rentals from Rent the Runway's 2018 collection that are around $100 OR LESS to rent for your engagement session. Why It Works: Soft colors photograph more romantically, which is just perfect for your engagement session! The lace detail gives the dress texture and character while the sheer hem can let some light peek through. Why It Works: Wrap dresses are super flattering for many body types. The color is just beautiful and will work with most skin tones. Also, it reminds me of Kate Middleton's engagement dress, which is a win in my book! Why It Works: The soft color is super feminine and can be dressed up or down depending on how it's accessorized. It's tailored but not stiff and is a fun alternative to a dress if you're not a dress-wearing kinda gal. Why It Works: Any type of skirt or dress that offers movement is a great option for portraits. This skirt can take on a more casual or formal vibe depending on what top it's paired with and how it's accessorized. Why It Works: The textured top gives interest to the dress and the ballerina skirt will allow for playfulness and movement. I usually suggest staying away from bold colors like this, but it has a great downtown vibe and would look amazing against a neutral backdrop. Why It Works: What's better than a LBD? It's classic, it's fun and neutral! Why It Works: Neutrals are great! The pop of black will offer nice contrast in your images. 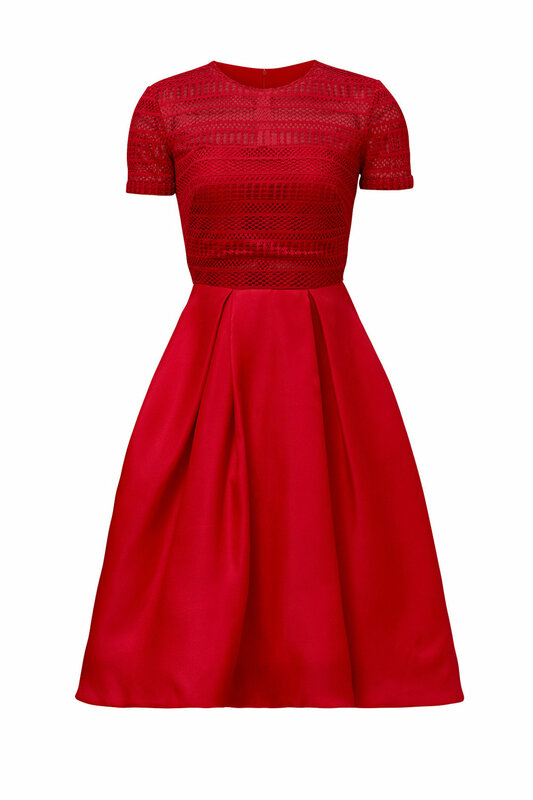 The lace neckline adds a feminine touch and visual interest. Why It Works: The fit-and-flare style of this dress allows for great movement. I love how this says "bride" without being too much. I generally tell my clients to steer clear of white on top, but the gold lace overlay on this dress adds enough contrast that it gets my stamp of approval! Why It Works: The larger floral print is a great option for clients who prefer a little pattern. The lavender color is soft and romantic and the wrap top will flatter the natural waist. Why It Works: For those who want a truly elegant style for their engagement portraits, the Winona Gown by Catherine Deane is an excellent choice. The gorgeous dark purple color is rich and romantic while the lace insert back brings a delicate and interesting element. No matter what you decide to wear for your engagement session, the bottom line is that you should feel comfortable and confident. Listen to your photographer's tips about what photographs well and use them as a guide to make a great selection for you, your body type, and your style. My final tip is to start shopping early! My engagement sessions are typically scheduled about two months from your booking date. Don't wait until the last minute to start trying things on and finding what you like. Give yourself time to find what suits you and your style. Low stress is the name of the game, gals! Are you looking for a Lehigh Valley, Philadelphia or Bucks County engagement photographer? Contact Alyssa here! Photos courtesy of Rent the Runway.